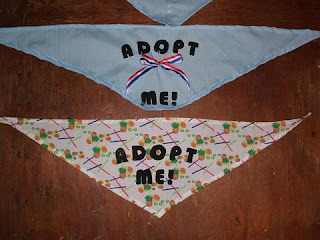 Isabella, Amy and myself are working on making bandanas that read "Adopt Me" for the dogs we have in foster. Tonight I finished screen printing the bandanas Isabella sewed and sent to me. (The bandanas were so beautifully sewn that I kind of felt bad having to alter them.) I have attached pictures of the bandanas as they are right now. Some need to be touched up. The one with the little red flowers still needs to be printed with white paint so I will do that tomorrow when the screen dries. 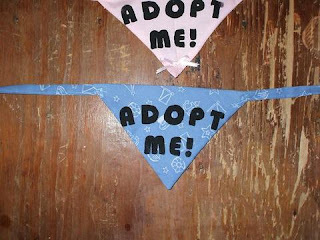 I will send the bandanas out later this week when they are finished. Amy is completing another 6 pink and 6 blue bandanas as well. We will make more bandanas if necessary. 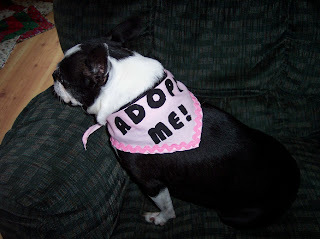 And here is a picture of Pittsburg wearing her bandana. How could anyone not want to adopt her? We’ve been living with these four dogs. 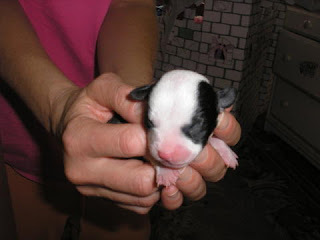 It’s all an accident: we had one dog, a Boston terrier (a female), and then in August we fostered an elderly dog, another terrier, to save her from being put to sleep, and then somehow in October she had puppies, just two, small-size, no bigger than teeny baby mice when they were born — the three of them fit in a little box from FreshDirect. And it was so sweet how this dog from the streets, who’d been through hell, was able to have her puppies in a nice home and not in a shelter. … Well, if she’d stayed in the shelter she wouldn’t have had them because they were going to put her down. But now here she was, getting to be their mother, and to take care of them. And we were so amazed and so moved that we, or I, decided that she and her puppies would always have a home with us and we would all live happily ever after. Until a few days later when we realized that her ancient body wasn’t providing her babies with enough milk, and we had to spend $500 at the vet. (We’d been to a vet with her before, a vet who thought she had Cushing’s disease! Silly! She was pregnant!) And so we got the formula and the little bottles and the eyedroppers the vet said to get, and we fed the puppies every two hours, and after a while the mom’s milk finally came in — hurray! — so we were able to sleep through the night again. But then the mother got in a fight with our original dog and got her cornea scratched. And though I never go anywhere, I was about to go to Miami for two days for work, and the vet said the mother couldn’t nurse while she was on antibiotics: “Sorry.” My husband would have to feed the puppies every two hours while taking care of our young daughter; I told the vet that just wasn’t an option, because I was already on thin ice, so the vet sent me to a fancy emergency place that was able to fix her eye for the weekend. It was $500 for the regular vet, another $1,000 for the emergency vet. But it was worth anything to keep my husband from having to nurse those puppies for 48 hours by himself. 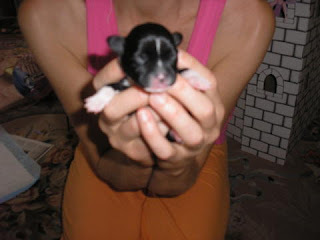 After that we decided we couldn’t keep all the dogs, just the original dog and the male puppy, and maybe the mother because she’d been through so much and she was so old and the idea of putting her in another home brought tears to our (my) eyes. 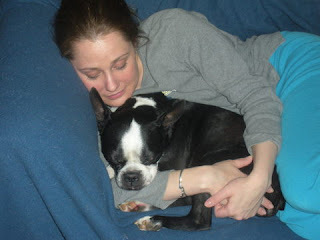 The problem was that I’d become very attached to the female puppy, so I didn’t want to give her up either. At first, when the puppies started leaving the little box to do their business, it was sort of cute — teeny puddles and tiny poopies — and I tried to teach them to go on the Wee Wee pads ($39 a pack). Then after they got their shots ($875) it was O.K. to take them out to housebreak them. But they screamed on the leash. Like, “Yow!” And walking four dogs in the cold wasn’t that fun for me, either; four dogs like to go in four different directions. (A couple of times, I was this close to letting them all go — after all, if you love something, you’re supposed to set it free.) So I decided to put off housebreaking till spring, and in the meantime let them go on the Wee Wee pads, or near the Wee Wee pads. But usually they went “nowhere near” the Wee Wee pads. They were born in our daughter’s room, so that’s where they liked to go, in particular the needlepoint rug with the pale blue and pink roses. But now the guy is here with his calculator. And my husband, who is putting his coat on and getting ready to leave for work, says, “So far they’ve cost us more than a month’s rent, Julie.” (It’s never good when he uses my name; he does it so I can’t pretend he’s talking to someone else.) As he gets in the elevator, I lean out into the hallway, and I yell, “I’ll figure something out.” And I will. I swear I will. 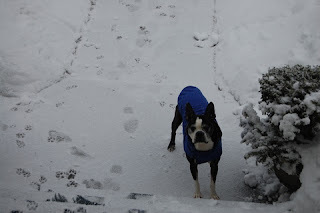 My snow Boston Jack. He loves the snow!!!! At about 4 am, I was woke up by weird noises in my living room (dog-type). I dragged out of bed, went down stairs and found Jaime (BT foster-who was fast asleep under the covers on my bed when I first went to sleep) and Carrie (greyhound) playing tug with a HUGE dog bed!!!! I have to say, it was one of the funniest things I've ever seen!! Of course, that got Paige (greyhound) all fired up, so Paige and Carrie ran the Riley Stakes in the backyard at about 4:30. What a way to *reluctantly* start the day! 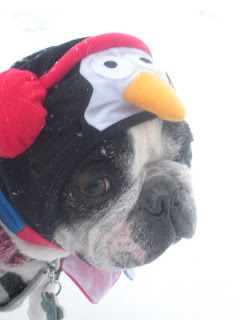 Had to share a couple photos… my handsome Lucky man in his famous penguin hat (that he despises! )… and Normie boy. As you can see from the photo, he is very happy! Hi Friends, Just thought I'd share this short essay with you. Thank You for bringing this foster dog into my life. Had I not made the decision to participate in rescue, I would never have had the chance to meet him. 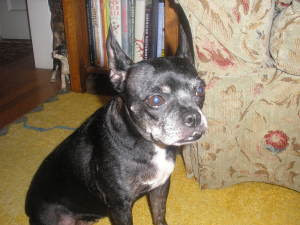 If I had sat here comfortably in my home and said "I already have four dogs and I know that I couldn't take in another - even on a temporary basis," I would never have met this dog. Yes, it takes time to rescue and foster... but who gave me Time in the first place? And why or what was the reason I was given Time? To fill my own needs? Or was there another reason ever so small and seemingly insignificant, like rescuing this one dog, that could make a difference in another's life? Perhaps to add joy, hope, help and companionship to another who is in need? With great sadness, I sat down on a footstool in my kitchen this morning and watched as this foster dog bounced back into the house and skidded across the floor to sit ever so perfectly in front of me. He was the picture of health, finally. He was all smiles for me.... and I smiled back at his happy face. Deep in his eyes, the storm clouds of illness and generalized poor health had blown away, and the clear light of his perfection radiated out from his beautiful soul. He holds no ill will toward man. He forgives us all. I thought to myself as I impressed this one last long look of him into my heart, what a very fine creature you have created. Tears slowly pooled and spilled over my cheekbones as the deeper realization of how wonderful this dog is sank into my internal file cabinet of Needful Things to Remember. Lord, he's a dog - but he's a better human being than I am. He forgives quickly. Would I do the same? He passionately enjoys the simple things in life. And I have often overlooked them. He accepts change and gets on with his life. I fuss and worry about change. He lives today and loves today. And I often dwell in the past or worry about the future. He loves no matter what. I am not that free. Something to cheer up your day. Had to share, watch carefully for the BT’s.